Doing chores at home is a great practice exercise for what your child will need to do as a grown-up. Chores help your kids to learn essential life skills that they will need for living independently. They also help your kids to develop a work ethic. However, getting kids to do their chores is a common argument in almost every home. Many children don’t like to be taken away from something enjoyable that they are doing, such as playing video games. Accomplishing a household task is also not as satisfying or rewarding in today's age of nearly instantaneous gratification. It is also important for you to know that kids do not value the same things as grown-ups do. A clean room just might seem unimportant to them. The best way to inspire your kids is to use their natural inclination to be doing something all of the time. You can also let your kids be a bit creative with their techniques so that they can feel like they are a productive and true member of the household. Having your kids pitch in with the chores demonstrates to them that families are built on social cooperation and that everyone needs to contribute to the home's functioning and help one another. Introducing the concept of chores works the best when you start from an early age. Even toddlers want to help you around the home, beginning around the age of 18 months. 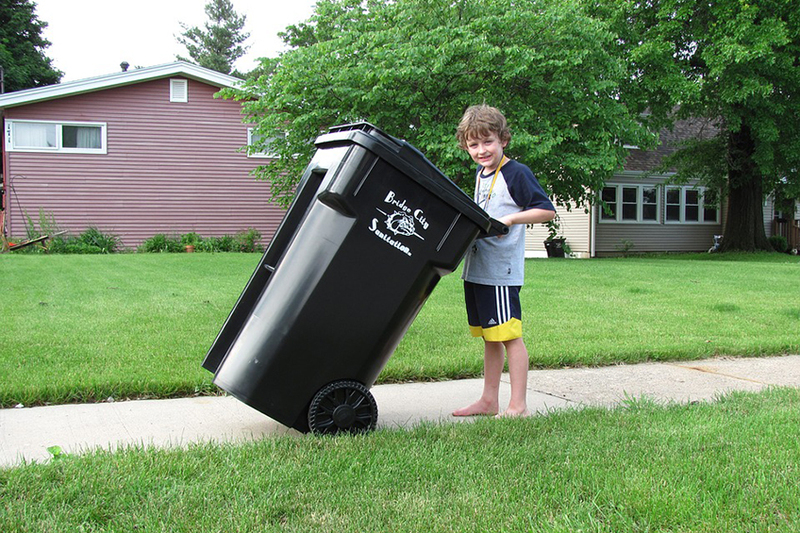 When you child wants to help, offer age-appropriate chores such as putting toys in the bin or clothes in the hamper. As your child grows, you can add more chores and more complex tasks to the to-do list. Know that it is never too late to introduce the idea of doing chores. Sit down with your kids and use positive terms to explain that their contributions to the household are essential to the home's functioning. Set aside some of your time and energy to show them how to do certain chores. This counts as quality time and helps to ensure that you do not have to re-do it after they do it. Show kids where things belong and how to use common cleaning tools such as brooms. To help you keep a visual track of all the chores, you can create or download a free template to make your own chore chart. Place the chart where the kids can see it, such as on your refrigerator door. Consider starting with four daily jobs such as dishes, taking out the trash, washing laundry and sweeping the floor. Rotate those chores between your kids. This can help to prevent your kids from feeling like they are stuck with a chore that they hate. 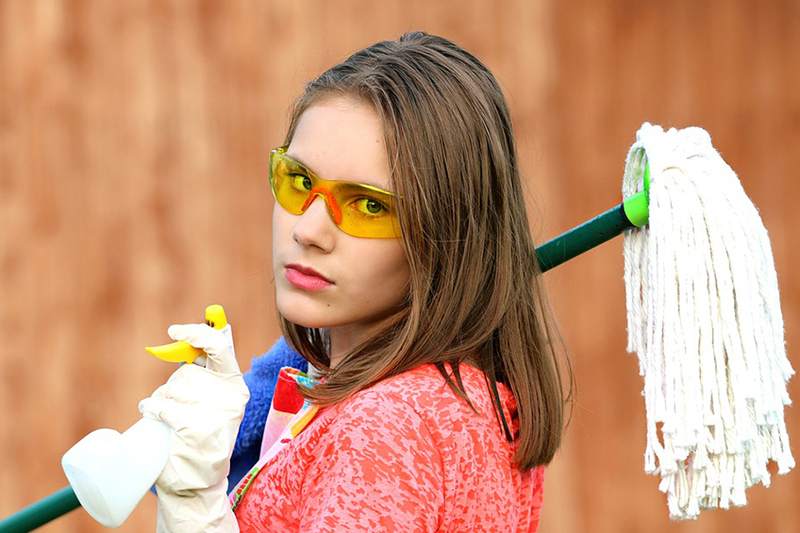 Deliver firm expectations about how and when to do the chores. You could also include weekly tasks such as cleaning the sink or mowing the lawn. Rotate those chores by drawing cards or alternating weeks. Incorporating chores into a daily routine makes them seem like second-nature. Choose inspiring times such as the 10 minutes before their favorite TV show or right before dinner. When chores are a routine part of what your child does every day, it becomes just one of those things, like brushing your teeth. Starting this routine at a young age ingrains it as a habit. For example, every night before dinner, you can have your kids can pick up any toys on their bedroom floor and put their clean clothes in the closet. Try to avoid using chores as a punishment for your child's misbehavior. Punishing your child by making them do chores will likely result in your child associate them with negative feelings. The only time this is developmentally appropriate is when your child performs a wrong to his or her sibling. A part of making amends in that situation could be an apology and performing a chore of the wronged sibling's choice. This act could be a tangible way of showing that the child was wrong to do that and is performing the chore in order to show the sincerity of his or her apology. You can turn regular, boring old household chores into a fun activity that is more stimulating to your child by turning on some music and dancing with the kids as they do tasks such as the dishes or sweeping the floor. When you do this, your kids will associate doing chores with something that is enjoyable rather than mundane. Chores can also be gamified by using a timer to see how many toys your preschoolers can pick up from the floor. Even toddlers can play a matching game with the family's socks while you put away the rest of the clean clothes and linens. Kids can roll the socks into paired balls and toss them into their dresser drawers as if they were playing basketball. You could also download some apps to your smartphone or tablet that can help you to turn a chore list into a game that gives your child points as the pass levels. Giving your kids the easiest possible chore can make doing chores more boring than you might think. Keep your kids challenged a little bit by adding tasks. For example, if your child usually sets the table for dinner, add in washing the table and place mats along with placing the silverware on it. You can then challenge your child to do this set of tasks faster. If your child shows a passion for something like growing flowers or vegetables, allow your child to perform the more challenging and physically harder work of digging the holes to plant the seeds, watering the seedlings and installing netting to keep away pests. Kids enjoy receiving a concrete reward for accomplishing a goal. You could combine their chores with a reward system to help foster a sense of responsibility. Keep in mind that the rewards don’t necessarily have to be monetary. 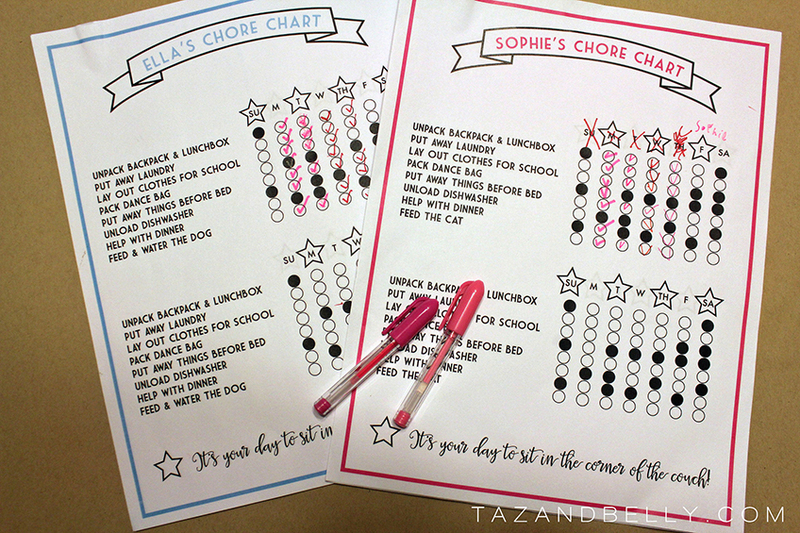 If you decided to make a chore chart, consider adding stars or stickers to it. When your child accumulates five stars for correctly completed chores, he or she gets a reward. It could be a popcorn and movie night or an extra 15 minutes of screen time. Younger kids might like stamps or stickers, while older kids may enjoy a one-night curfew extension of an hour. Hovering or bossing your kids will not motivate them to do their chores or get them done in less time. Allow your kids the opportunity to use their own motivation and self-reliance to get things done. Not using controlling or demanding language can help your child to feel like he or she is in charge of his or her actions. Rather than making demands, phrase chores as a suggestion. Word a request with gentler terms, "It is 7:00 pm, and Mr. Whiskers sure does look hungry. His bowl is empty." Your kids will learn to pay more attention and figure things out for themselves, and you will find that you need to deliver fewer reminders about what needs to be done. Understand that your standards of perfect or "done" might not be the same standards that your child uses. While you might color-code your socks and T-shirts when you organize your child’s closet, your child might be okay with having whites and brights jumbled together in the drawer. You can let your kids know what counts as a finished chore, but it is also okay to be flexible. Be sure to listen to your child if he or she says that a task is too difficult. You could provide some assistance or a tool such as a step stool to make the chore easier. Doing this sends your child a message that you are cooperative and forming a partnership in caring for the home. Even though your kids' methods of doing chores will not be identical to yours, the point is that they give it a worthy effort and that you appreciate the effort they put into it. Doing chores teaches responsibility and helps to strengthen family bonds. Chores also give you the opportunity to coach and support your child in becoming an independent and productive adult. Always praise your kids when they do a good job with their chores. This gives your kids the self-confidence to continue and will make chore times non-combative. Remember to thank your kids for their work and acknowledge that they have successfully completed their chores for the day or week. When started at a young age, chores are a gentle introduction to your child about what it takes to run a home. Your children will feel useful and appreciated when they are given age-appropriate tasks and enjoyable rewards for successfully completing those tasks. You will be able to have the satisfaction that you have taught your kids essential life skills that they will use well into adulthood.